After returning from Afghanistan, ex-British marine Joss Brennan embraces living as a double amputee, but he finds life at his safari lodge near Lake Kariba, Zimbabwe, not quite as idyllic as when he left. Peta de Longe is a big game veterinarian and no stranger to hard decisions. Working in the messy political society of Zimbabwe, she’s engaged in a constant struggle to save the national parks. When she nearly drives over Joss, the reunion isn’t joyous – Joss let down her dying sister eighteen months before, after all. But once she uncovers the terrible ordeal that Joss has gone through, can she learn to forgive and move forward? When a corrupt and dangerous businessman with close ties to government threatens all he holds dear, Joss realises he doesn’t need to save strangers in a faraway land. But will he fight to save his own country and the people he considers his family? Having lived in Africa I have a great affinity for the wondrous continent. However, even if you don’t have personal experience, there is nothing like a well written tale that can truly transport you to far off places. T.M. Clark’s novel is one such tale. This is brilliant! I was fully engaged from beginning to end in this mind riveting story. This tale has a little of everything, from intrigue and mystery that goes on to build tension and drama. If the individual tales of Joss and Peta (and her father) are not enough, the whole emotion surrounding corruption and poaching is heartfelt and real. The violence is confrontational, but it’s meant to be. On the flip side of this, is the beauty and majesty of the wildlife, especially elephants. The tale of Ndhlovy is truly touching and I just love how Clark followed through with her tale right to the end. I particularly appreciated the ‘Fact vs Fiction’ at the end, that detailed and debunked many of the core issues covered in this book. For example, ‘It is estimated that wild elephants will be extinct within twenty-five years’. A sad fact and this book helps highlight that more action needs to be taken now. I cannot recommend this book highly enough, especially for those of you interested in delving into this exciting genre. 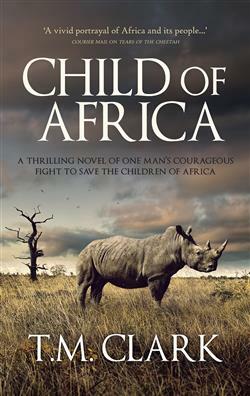 The writing is compelling as Clark weaves tales of corruption and traditions, ravages of war, poaching and preservation. Add to that a cast of characters - both human and animal - that demonstrate real depth, whether it be leadership and compassion, to being evil and sadistic - you have a story here that is worthy and totally engaging.